We did the math. There are 1,225 little squares in this quilt top. I think I would be completely crazy by now if I had cut them all out individually and pieced this together one square at at time. 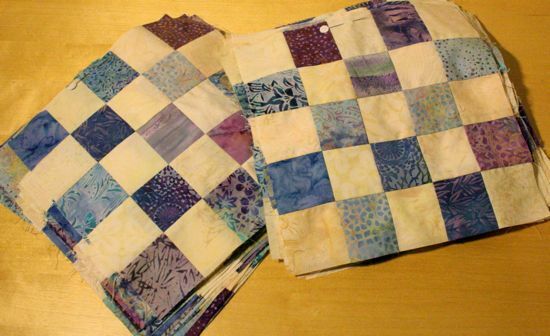 Hooray for strip piecing! 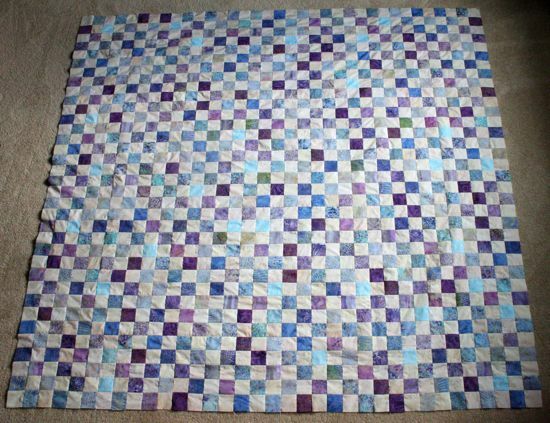 I'm really happy with how this turned out, and really pleased that start-to-finish (or at least this stage of finish - there's still a possible border and a backing and binding to add, not to mention the actual quilting part) was just a month. The PS I Quilt Quilt Along part was probably crucial for making sure I got this far this quickly. And I enjoyed how there were all these other people working on similar projects, even if I didn't spent a whole lot of time in the Flickr pool. (Someone posted a picture of a block in progress, and their computer was right next to their sewing machine - with the Flickr page on the screen!) There are some wonderful quilt tops posted in the Flickr pool, some of which may inspire me to do the postage stamp thing again. 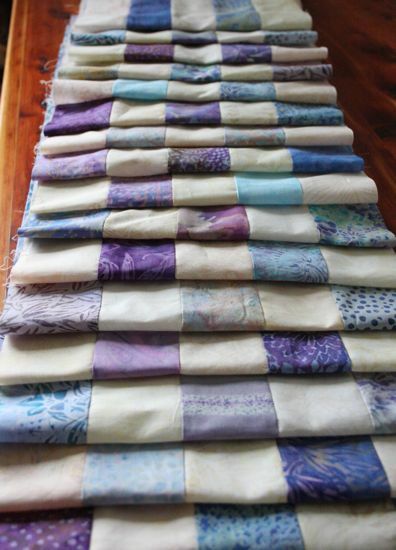 My quilt came out random, but there are some fun ideas for organized versions or differently random versions. Some of my favorites are here (dark solid and light print), here (organized), here (an on-point setting, and a double border! ), here (more random than most), here (black and whites! ), and here (orderly!). So many other possibilities to try! This is where I was supposed to be a week ago on the Quilt Along. Better late than never and all that. Now, to put the blocks together into a quilt top before Monday! I am a contradiction. I like things organized, everything in it's place, with minimal clutter. I don't generally have things just to have things; each thing should fill a purpose, the more the better. But I also have my grandmother's pack-rat gene. If it might be useful someday, it's really hard to let go of it. I force myself to recycle cardboard boxes instead of keeping every single one we acquire; otherwise we'd never be able to put the car in the garage. Caitlyn's baby things have gone into a box, although I'm not always sure who I might be saving them for. We have a baggie of walnut shells because they might be good for a craft project. And fabric scraps go into a basket: they could be good for mending, or crafting or tiny doll dresses or something I haven't thought of yet. I found a use for those fabric scraps last week, and I would love to take total credit for the idea, but, honestly, I probably read something about this somewhere in the last two years. I don't know that I actually have original ideas (perhaps another reason why I decided a bachelor's degree was enough - the threat of Original Research), just ideas that get lodged until they knock some other thought loose. Anyway, I had a pillow that needed stuffing. Sure, I have a bag of Poly-fil, but it probably wasn't going to be enough. Enter the basket of scraps. Line them up parallel, overlapping and layered. Going more than 3 layers made cutting difficult. Grab the ruler and the rotary blade and cut them into strips roughly 1/4 inch wide. Precision is not important here, but I found using the ruler helpful, although I suppose wildly zig-zagging the rotary cutter could get you to the same place. A lovely pile of small fabric scraps! Which can be used to stuff things! The pillow's not done yet (I actually didn't have quite enough fabric scraps), but it's close. It's also a lot heavier than any pillow stuffed with Poly-fil, so this may not be the optimum solution for all stuffing needs. But I found a use for those itty-bitty bits I was saving "just in case", and that makes this idea "full of win". I pulled up the rest of the carrots that were in the backyard over the weekend. They seem to have survived nicely, despite being snowed on and frozen. The greens were a little bedraggled, but the carrots themselves are short and reasonably fat, and cleaned up to a brilliant orange. The only thing left out there now is the kale, some of which is destined for a kale and yam something later this week. Quiche? Or with orzo and black beans? If I can get a similar number of carrots successfully germinated next summer, it's possible we will be able to do next winter's carrot supply entirely in this way. I have jars of blanched and frozen farmers' market carrots in the freezer, and we've not touched them. If the carrots spend the winter in the garden, that frees up freezer space for broccoli, the one thing I wish I had in there now. Last week's strip sets are this week's strips. Next up: piecing these together into blocks, which are likely going to be next week's project, despite being part of this week's instructions. Cutting 16 strip sets into approximately 272 (give or take a few) strips takes a bit longer to do than it does to say. Quandary of the moment: do I put these strips together somewhat randomly or do I try to organize them into thematic blocks? I'm leaning toward the random approach since it feels a little late to be organized. There are a few highly organized strips sets in the Flickr pool (here and here), and I think those quilts are going to be amazing. But since I chose my fabrics with a "meadow of purple flowers" in mind, that's probably how I should continue. Suggestions? It's been raining and gray, but there are buds starting to swell on the clematis and the cherry tree, and Cliff Mass says winter will be over in a month. The sarcococca the front yard is blooming, the hellebore might be thinking about it, and the rhubarb is trying again to put up a stalk after the last two have been snowed on and frozen. Gotta love the stubbornness of plants. So it seemed like a good time to sort through the seed box, throw out things "packed for 2007" and count what I have from last year (an unopened package of eggplant seeds?). I'm not planning anything ambitious for the garden, no "challenge vegetables" this year. I have the four beds in the back yard and the 100 sq. ft. p-patch plot 2 blocks away, and last year keeping up with those felt just at the edge of what I could manage. I admire all those who are working to feed their families primarily from their backyards, but I don't think I can count myself among them; partly it's a space issue and partly is a reluctance to take on the challenge (and mess) of livestock. I'm sticking to veggies and the farmer's market, the usual canning and freezing and drying activities, and maybe more batches of traditional cheddar (the best of last year's hard cheeses). The seed orders are in: potatoes, onions, and a melon from Seed Saver's Exchange and spinach, peas, carrots, butternut squash, zucchini, and kale from West Coast Seeds. I still have beans, pumpkins, mixed greens, basil and that unopened package of eggplant seeds. I'll get tomato plants from the farmer's market in June and order the seed garlic in August. So I think I'm ready for you, Spring, and I'll see you in late February. 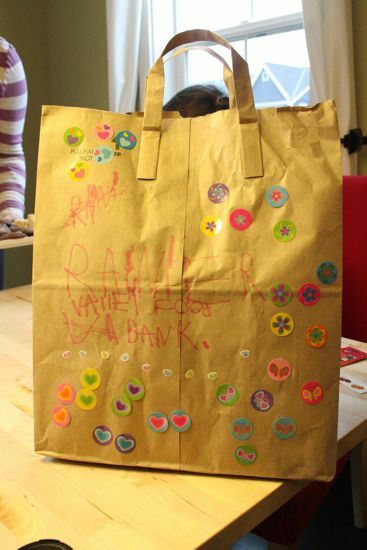 Caitlyn's hand-decorated and labeled bag for receiving MLK Day Food Drive donations. In the week or so before Martin Luther King, Jr. Day, I received a flurry of messages about making the day one of service, a "day on, not a day off." Not many of the service projects, though, seemed appropriate for kindergartners. When we have P-Patch work parties, Caitlyn comes, but her actions there are more Caitlyn-staying-out-of-the-way (ie, climbing on large dirt piles or digging randomly in an open plot) than Caitlyn-doing-community-projects. It's possible she'll learn about the importance of participation and community involvement by watching me do it, but I think there's benefit to her being more hands-on sometimes. When one of our neighbors announced an impromptu MLK Day food drive to benefit our local food bank, I promised Caitlyn would be there. 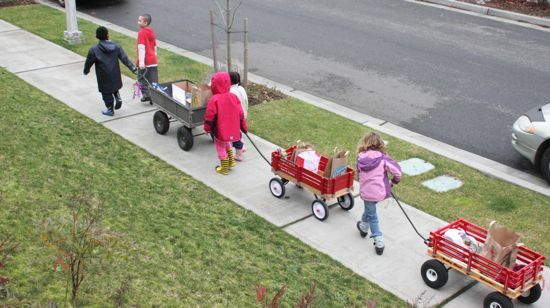 Here was a Day of Service activity that made sense for a five year old. Yeah, maybe for her it was all about running around the neighborhood with her friends and the hide-and-seek of finding the donations people had left on their porches. But maybe, just maybe, it was another small lesson in generosity and helping out in your community. I finished the strip sets for Rachel's Postage Stamp Quilt Along over the weekend. Just in time for the next set of instructions! And both sets, alternated to give a sense of how the final quilt top will look. It's turning out a bit more on the blue side of things than I expected. That's one of the challenges (and possibly a fun part) of buying jelly rolls of pre-cut fabric: it's all rolled up and you're left trying to figure out what you've got by looking at a bunch of edges. On the other hand, there are fabrics that I wouldn't gravitate toward when looking at the full pattern on a bolt but just sing for me when all I've got is a narrow strip. Weird, huh? 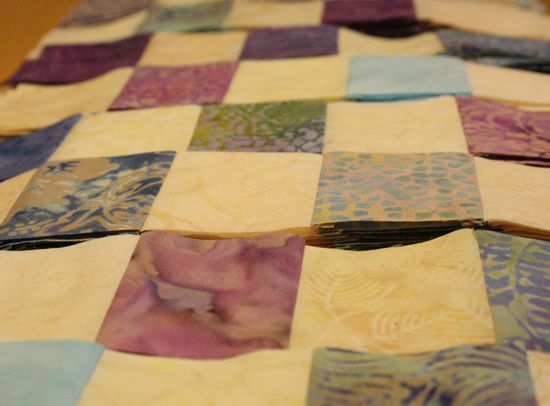 To see what other people in the quilt-along are doing, check out the Flickr pool. There are over 200 people participating in this quilt along, and there are some amazing-looking strip sets in the pool. Some folks are using jelly rolls I thought about (now I get to see what those rolls look like on the inside! ), and some folks are using some color combinations I wouldn't have thought would pop the way they do. 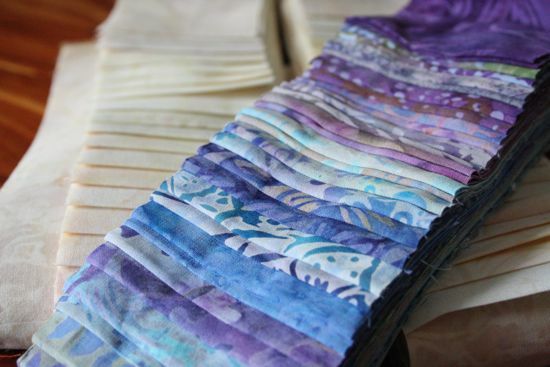 In a way, it's almost like making a separate quilt for every pair of jelly rolls I thought might play well together - only without the actual work of making more than 20 quilts! My grandfather loves his sweets. One of the best things about staying with my grandparents for an evening when I was in elementary school (ok, and later, too) was that I always knew there would be dessert after dinner. Dessert was a rare treat at home, but Grandma always had something, even if it was only a bowl of fruit or a scoop of ice cream. I can't quite remember a time before the candy. I think Grandpa started making it after their house was finished (or what passed for finished - to this day, I don't think my grandparents think their house is finished), but I'm not sure. The caramels, gooey and sweet and stick-to-your-teeth and melt-in-your-mouth, would arrive about Christmastime, in a shiny red tin. It didn't matter how many were in there; I never got as many as I wanted. Over time, the caramel-making tradition turned into a full-blown candy-making extravaganza. Candy cooled in the front bathroom. Ingredients, molds, specialty tools, packing options would fill the kitchen for the whole of December; I have no idea how Grandma ever made dinner that month. I loved dropping in - with a "legitimate" reason, of course, although everyone probably knew I had Ulterior Motives - because there was always something that needed sampling. Grandpa kept up with the caramels, and added English toffee, peanut brittle, candied ginger, brandied apricots, chocolate covered cherries, truffles, nougat, and probably things I don't remember. Red gift bags joined the Christmas tin; it wasn't Christmas without either one. The December candy making slowed down eventually, probably before I went to college. While I was at Westmont, my grandparents would occasionally sent a non-Christmas box of caramels, and I bet there are a few former dorm-mates who remember those boxes. Gradually, though, even the caramel-making stopped. Grandpa is, after all, 90 years old. I missed the Christmas "Grandpa candy", but there always seemed to be a reason I couldn't be the one to keep the tradition going. I didn't have a marble slab or a copper double boiler. I didn't even have a candy thermometer. Candy-making was magical and mysterious, and it needed Special Tools, or at least a Kitchen the size of Rhode Island. Interested parties can thank Elise Marley for being the nudge that sent me off for a totally ordinary double boiler and a candy thermometer. This year, I brought back the Christmas caramels. And the English toffee. And a little peanut brittle. I'm simply thrilled to be able to share the eating of them with Caitlyn, and I'm hopeful that maybe I'll be able to talk her into helping someday. It's such a little thing, this candy tradition, and I can't quite express how happy I am to have it back. It'll be a long time before I match Grandpa's Candy Making Heroics - he made 80 lbs one year, at least - that's a bit less than two Caitlyns worth of candy! - but I made up gift bags for the family. Mom nearly melted when she tried the toffee. And Grandpa? My caramels were the first food he asked for when he came out of surgery this week. I think he approves. Ok. Now I know. 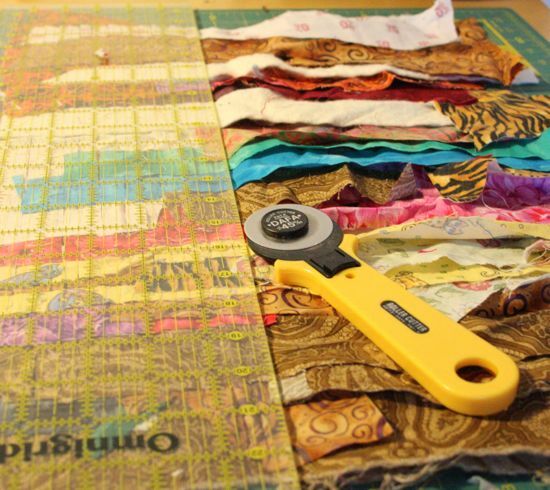 When doing a project with pre-cut fabrics, make sure all the pieces are from the same manufacturer. 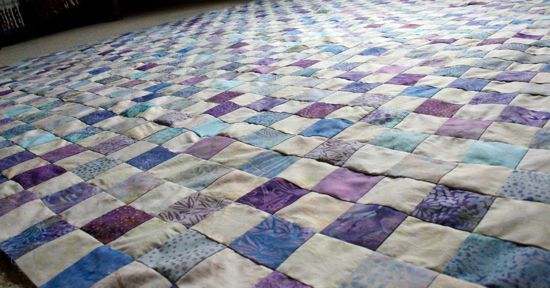 In my quilt along fabrics, the purple strips from Island Batik are about an eighth of an inch wider than the cream strips from Timeless Treasures. Since this would throw off the corner alignments when it comes time to do the piecing, I'm trimming them down as I go. Hopefully this works. And in the future, I'll stick to one manufacturer at a time since this fiddly stuff is the sort of thing buying pre-cut fabric is supposed to avoid. 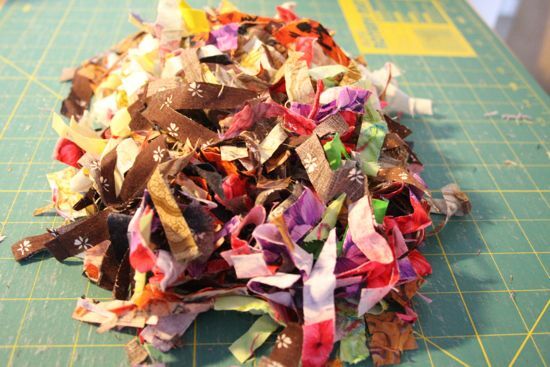 Anyone have a use for fabric confetti? I'm part way through assembling "strip set b" (not sure why I started with the b's instead of the a's - probably in how I organized the set groups). Pictures coming soon, I promise. 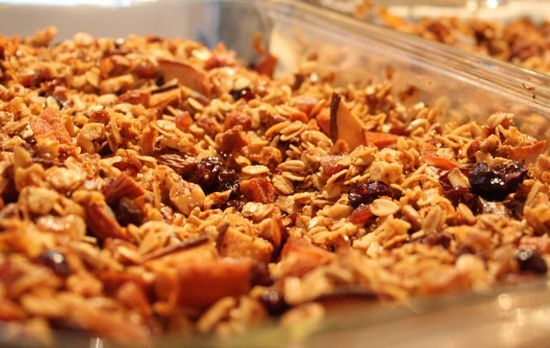 We received some yummy homemade granola for Christmas (thanks to the Portland aunties! ), and at Caitlyn's request I rounded up the ingredients to reproduce it on our own. I scooped and Caitlyn poured and stirred. I think she had a good time helping, although she didn't sound so enthusiastic when I asked if she'd want to do it again, something that I think has more to do with the granola-making taking the whole morning and using up her intended Lego time than with the actual granola-making itself. The report from breakfast today, though, was that she ate it enthusiastically. And even if she's reluctant to sign herself up for more granola-making, she did verify that I was not putting a new case of elsewhere-made granola on this month's bulk order. I'll take that. My fabric for the Postage Stamp Quilt Along arrived yesterday! I'm going with Meringue from Timeless Treasures and Sweet Pea from Island Batik. Love batiks. Love them, love them, love them. Despite all advise to the contrary, I spent my "creative time" this afternoon prewashing these strips. I prewash just about all fabric that comes into the house, but it gets iffy when the fabric is pre-cut. 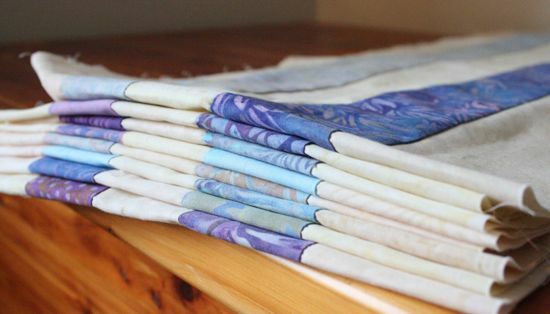 But since I'm using fabrics from two different manufacturers, I was concerned that the shrink rates would be different (in the past, when using pre-cut strips, I'd piece the strips and then wash the results before continuing - this works if all the strips are from the same manufacturer). And those rich purples... they were bound to bleed a bit. So, I grouped them by color and soaked them in warm water for 10 minutes. The purples bled, as did the blues, so I think I made the right choice. About a year ago, I was reading a handful of blogs on sustainability and coming environmental apocalypse, specifically Crunchy Chicken during the annual "Freeze Yer Buns" Challenge and Casaubon's Book when the author was discussing how her family dealt with low interior temperatures. These are people who, when it gets cold, don't turn the heat up - they add layers. Casaubon's Book, which, in general, looks toward history to find solutions to such problems, mentioned the petticoat. It's weird that I'd more or less forgotten about petticoats, given my general tendency toward antique fashion. I appreciate that I can wear jeans without being sneered at, but I do like a long full skirt. (In high school, some Civil War reenactors came to do a presentation, and the woman expressed a certain amount of shock over the dreadfully high hemlines on the girls in my class. My skirt did go below my knees, and I remember trying to adjust the way I was sitting to make it look longer, or at least tuck my ankles out of view.) But it wasn't until reading those blogs that I completed a train of thought that went something like: I like skirts, I appreciate the need for layers in the cold months, women used to layer their skirts to keep warm, I need a petticoat! 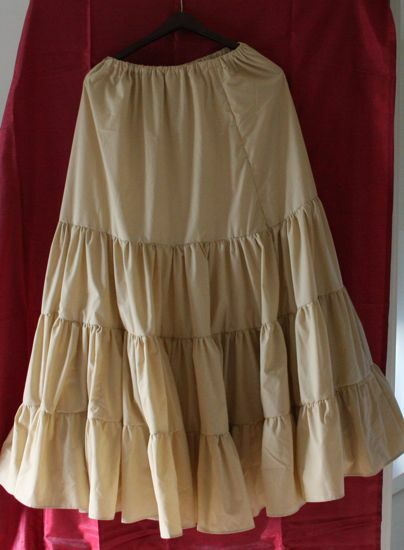 After some poking around online, I found A Petticoat for the Ages over at The Anticraft (good stuff, but some discretion advised). It's a solid set of instructions, although I made a few adjustments along the way. First up, the instructions from Anticraft have only two 9 inch tiers. This would have resulted in a petticoat that would have been approximately 36 inches long, about 10 inches too short for me. I added another tier, which throws off their yardage recommendations. 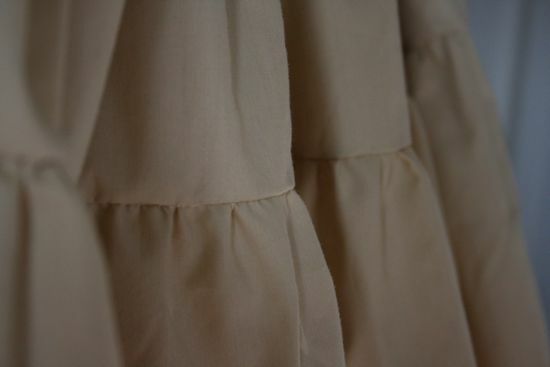 Also, their instructions were to cut the 9 inch strips lengthwise from the purchased yardage; this results in the grain of the fabric going perpendicular to gravity, which I felt could cause the petticoat to hang unevenly. So, I did my own calculations and bought a crazy amount of muslin. Three tiers works out to being 14 nine-inch tall, width-of-fabric strips. The bottom tier is almost 300 inches wide. I also adjusted the measurements a little for the top tier, rounding the "width at knee" measurement to an even 60 inches. This made for some easier math and a little extra fullness away from the hip. Should I make another petticoat, I think I'll experiment with either adding a separate waistband or adjusting the top of the top tier. The instructions currently call for trapezoids for the top tier (good, since that reduces the amount of fabric at your waistline, where you don't want the extra bulk), but that makes for some awkwardness when you go to turn under the top for the elastic casing since the top of the trapezoid is ever-so-slightly narrower than the bit one inch down where you are trying to sew it. 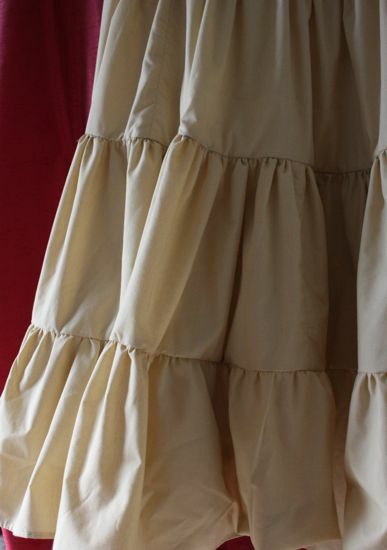 The original instructions call for a sewn-in lining, but suggested using the finished petticoat as a template for determining the size and shape of the lining. I opted to revisit the trapezoid instructions and made a tissue paper pattern with a top that matched the waistline measurement of the petticoat and a bottom that was slightly wider than my stride. I've received some lovely complements when wearing my new petticoat, usually about the resulting fullness ("poufy-ness") of my over-skirt. And it's warmer than you'd think it would be. There's the extra layer, but I think it's also about creating a movable envelope of air around me. I wear two layers in pants form through a lot of the Seattle winter and two layers of skirt is actually much warmer. 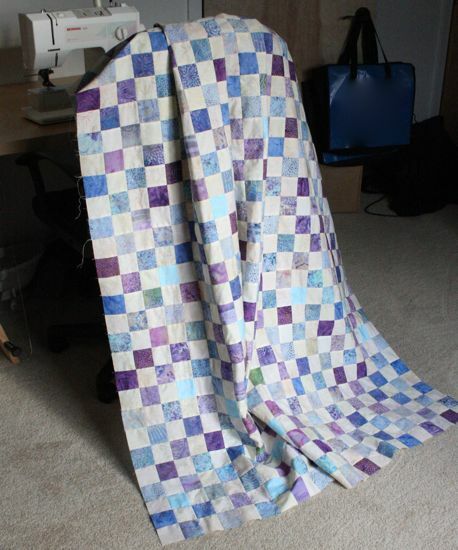 About a year or so ago, I discovered PS I Quilt, just about the time that Rachel started a Pinwheel Sampler Quilt Along. It didn't take long before I was wishing I had found the site just a week or two earlier, or that I had jumped into the quilt along before I really knew what it was about. And I promised myself that the next time Rachel announced a quilt along, I was getting involved. Guess what? 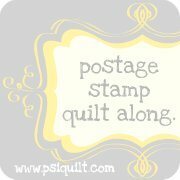 Rachel's announced a postage stamp quilt along and I'm gonna play! I ordered the quilt top fabrics yesterday, and they'll be here on Monday. So hard to choose! I have yet to do a lot of fabric acquisition online (which could be a good or a bad thing, not sure yet), and there were so many more options online. Do I use the quilt along as an excuse to try out a fabric design that I don't usually work with or go with something safe and comfortable? I opted for comfortable, figuring that the virtual group quilting experience was stretchy enough. Hopefully I'll remember to grab a picture of the box when it arrives next week. 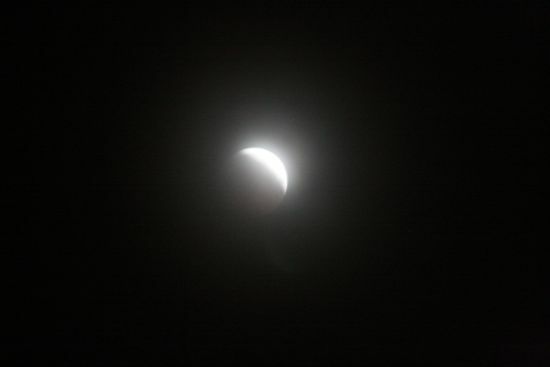 At the risk of being officially labeled late to the party, I'm posting photos from the lunar eclipse last month. I remember watching a lunar eclipse when I was a kid, though I don't think the one I remember required waking up in the middle of the night. My folks did get me up for Halley's comet in 1986, though I remember being cold and the frequent comment that I would probably get to see it twice (it returns in 2061) more than I remember actually seeing the comet. Who knows what Caitlyn will remember of this recent eclipse - the event itself or the novelty of being woken in the middle of the night or something else entirely. 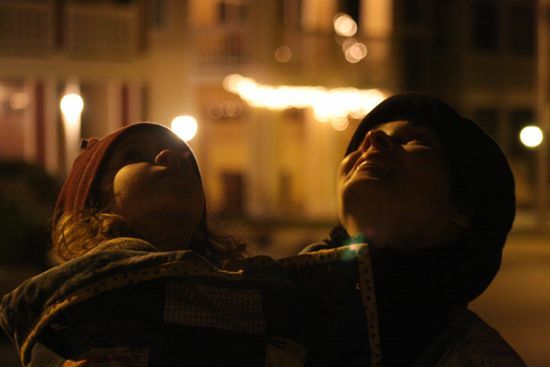 We stood outside, wrapped in a quilt, and watched the moon (through the clouds) as it disappeared into totality. Caitlyn sounded a bit exasperated with the adults as we made various suggestions for what was going on: Was something eating the moon? No, she'd sigh, it's a shadow. New Year's Day was lovely - if colder than I'd really like - and filled with assorted prep work for some assorted projects. Then Caitlyn decided that she'd really like to start the year with a stomach flu, so my Day 2 of 2011 has been spent sitting with a feverish girl who begs for water after throwing up all the nothing that's left in her tummy. Two days old and already the year is reminding me: Balance, Pace Yourself, You Are Not Always in Control. I don't generally make Resolutions for a New Year. While the change in the calendar makes a nice starting point, sometimes it feels like waiting for January 1 is both a form of procrastination and an assurance of failure. Maybe if resolutions didn't kick in until mid-January, when the cleanup from the chaos of December was done and life had returned to What Passes For Normal, maybe then they wouldn't feel like Unreasonable Expectations. I am, however, attempting to state some goals, in no real order. Make a real effort to do something creative on almost every day. It doesn't have to be a big something (progress on a large project counts) and it can be in almost any medium: fabric, paper, pixels, text, paint, food. At the end, there should be Something where there was previously Nothing. Make some progress on the long-term project of cleaning and purging our lives of the stuff we're done with but haven't figured out how or where to let go of it. Everyone's Perennial Favorite: Exercise more for overall health. Be more present in the various moments of my day. Listen to the people who are talking to me instead of nodding while planning dinner in my head. Be a better, more patient and less short-fused parent. There's also the garden and the p-patch (first seed catalog arrived last week), my work, assorted potential travel plans, community involvement, food storage, home improvement. And books to read, meals to make, outings to plan, projects to support, dreams to enable. May 2011 be bright and bountiful, for all of us.